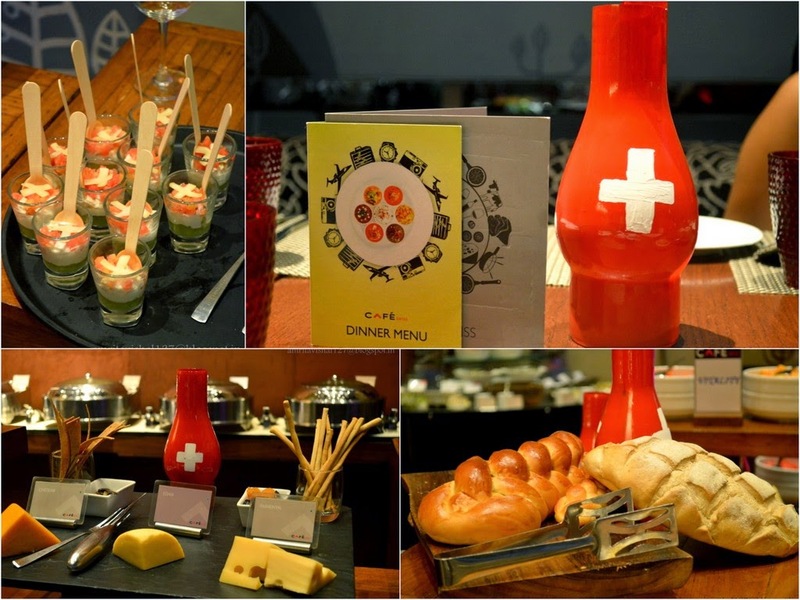 Swissotel Kolkata Neotia Vista, celebrated Swiss National Day which falls on August 1 with a lavish inaugural dinner at Cafe Swiss and Kolkata Food Bloggers were invited to join in the fun. Being a weekday me and Vishal got a little late to reach there and missed on the celebrations before the dinner which included some games. Enakshi Kundu greeted us with her warm smile as always and we got ourselves seated with the rest of the gang from KFB. Very soon we met Pastry Chef Sanjay who has a heart as big as himself and creates the most droolworthy desserts and is super humble. He introduced us to Chef Abhiru Biswas who has flown in from Mumbai to take special sessions on chocolate and recommended his creations on the dessert counter. 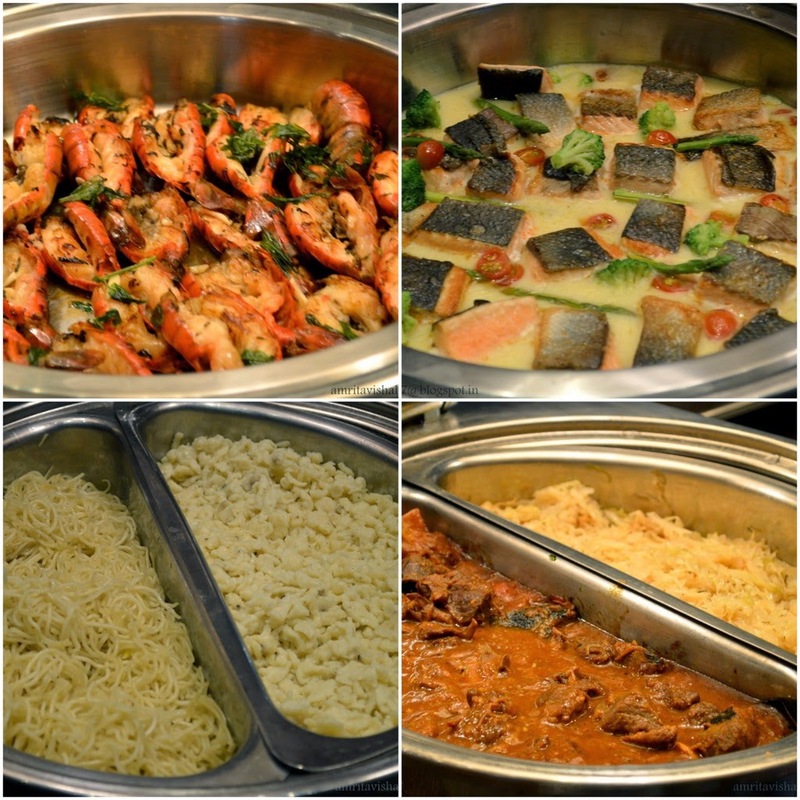 With not much knowledge about Swiss food apart from their cheese and chocolate, we were happy to discover the widespread delicacies from the region. 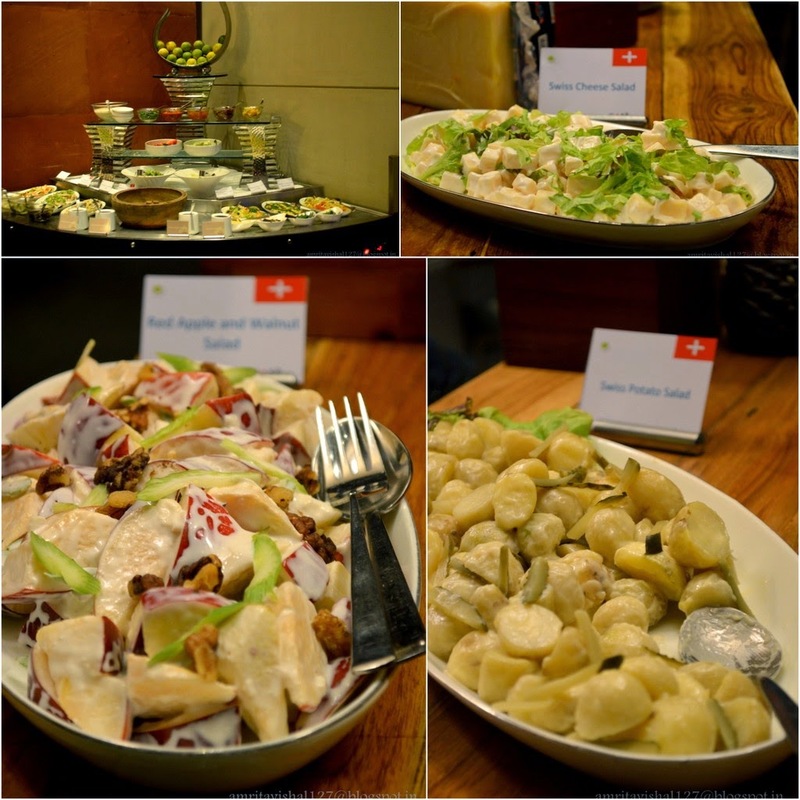 The salad counter was loaded with fresh, creamy and cheesy dishes like Swiss Potato salad, Red Apple and Walnut salad, Carrot and raisin salad and Swiss cheese salad...just to name few. The Swiss love their potatoes as much as their cheese and chocolate and it was evident with the traditional Suuri Gummeli (potatoes with sour cream) and the famous Roesti with melted cheese on top which added to the sinful experience. 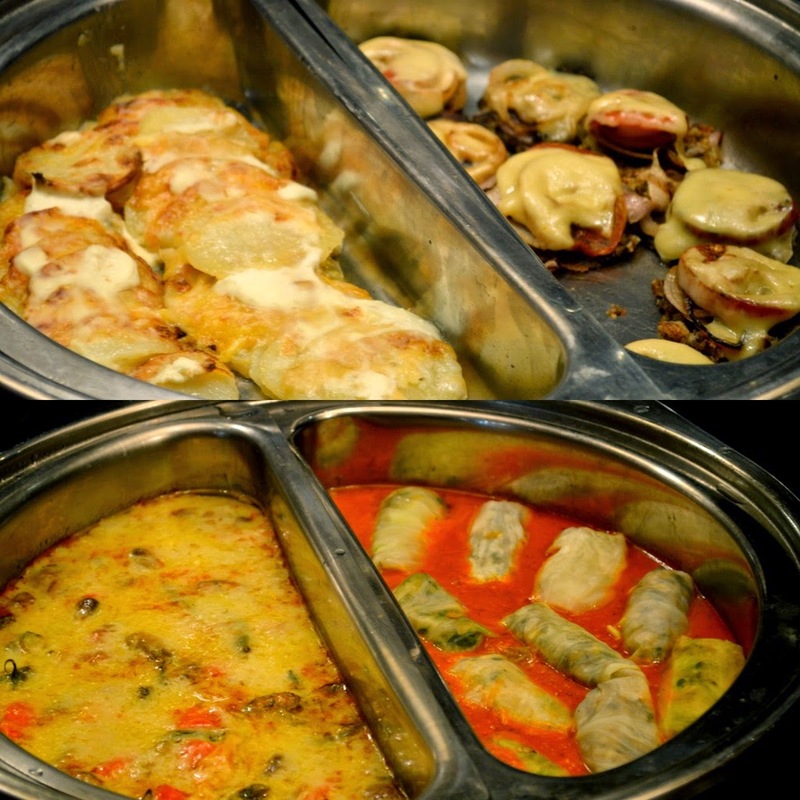 Also on the spread for vegetarians was Swiss vegetable casserole and Capuns which has steamed cabbage filled with vegetables served in a tomato based sauce. The Food extravaganza had just began and we continued our journey with the beautifully cooked Prawns with Garlic flakes and olive oil and Salmon cooked with sparkling wine, fresh herb and cream sauce. The Spatzle and Urner Hafelichabis (spiced lamb and cabbage stew) were traditional dishes from the region and I personally loved the latter. 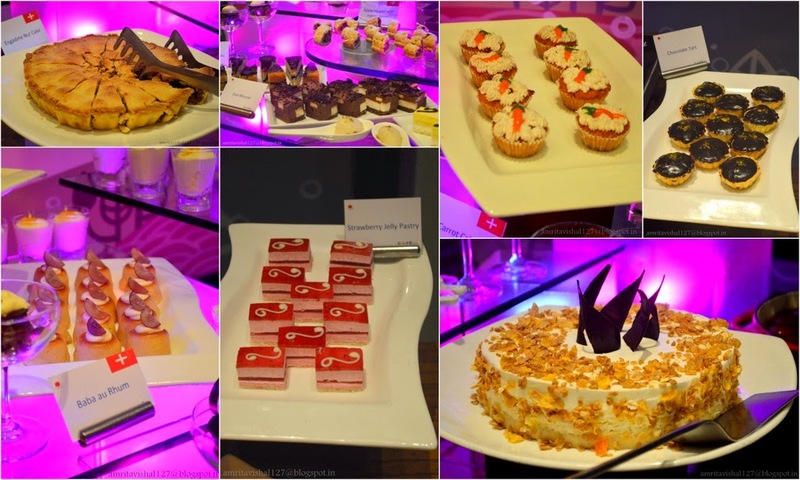 If you are wondering how could we have any more place in our stomach, let me tell you that Swissotel's Dessert counter is a beauty in itself and is as lavish as their main course spread. And how much ever full you feel, you can never say no to their awesome range of desserts. I was definitely in for some treat with Strawberry Swiss rolls, Baba au Rhum, Engadine Nut cake, Swiss muesli Quark cheese torte, Mini Carrot cupcakes, Duo mousse, Raspberry milk chocolate torte, Apple strudel with vanilla sauce and many more apart from the Chocolate fondue. I loved the mini carrot cupcakes exuding the gentle cinnamon flavour and the Engadine nut cake bursting with walnuts. 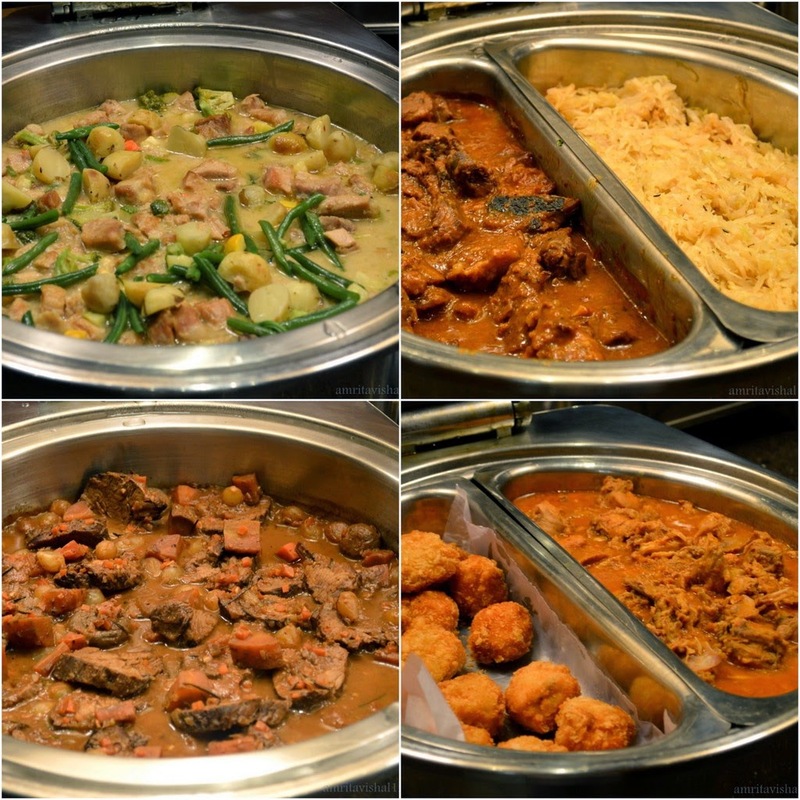 The hallmark of Swissotel is an awesome meal with the best of products and warm hospitality.